Northern State University (Aberdeen, S.D.) was challenged recently by the need to create residential facilities for students arriving at college with a different set of privacy boundaries and lifestyle preferences than any generation before. The university also wanted to lure current students back from off-campus housing because living in the core of NSU’s campus provides students with easy access to activities, facilitates deep engagement with the campus community and increases interactions with faculty and staff. To meet the needs and expectations of the next generation of college students, NSU has introduced three new, modern residence halls on campus: Wolves Memorial Suites, which opened in fall 2017; and Great Plains West and Great Plains East, set to open this fall. The plan is working—housing applications are up 20 percent from last spring. 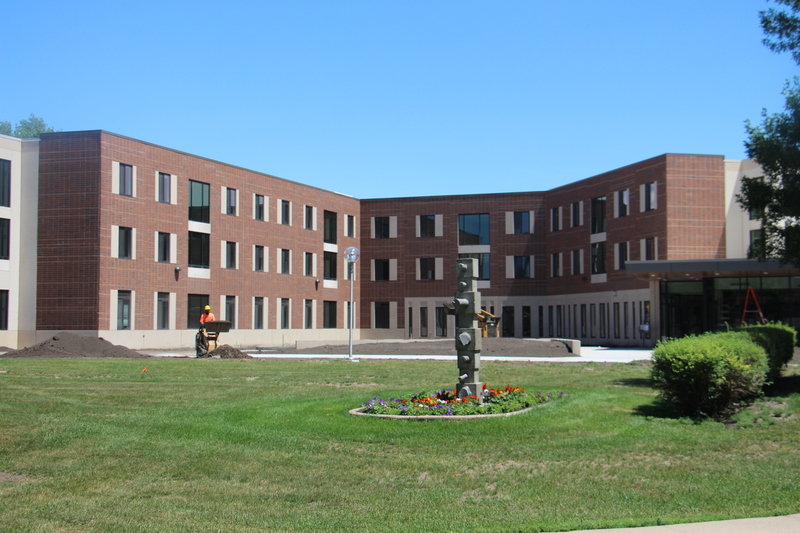 As of March 1, 157 new students had applied to live at Northern this fall, according to NSU Director of Residence Life Marty Sabolo. That compares to 127 housing applications last year at the same time and 89 requests the previous year. Sabolo said the uptick in housing requests is a direct result of NSU’s new dynamic living communities. Students are embracing these new on-campus housing options that mirror today’s diverse society and provide the foundation for academic success. In designing Great Plains East and West, a key ingredient was simply more space. Privacy is becoming a highly sought after amenity, with the majority of freshmen coming to campus never having shared a bedroom. The appeal of suites reflects how living situations have changed over the years. Thirty years ago, Sabolo said, students moving to college were coming from homes with five or six family members and only two or three bedrooms. Nowadays, families often have one or two kids but four or five bedrooms. Sharing space isn’t something today’s youth are used to. “I think it’s what today’s students really want, especially the suite-style rooms,” Sabolo added. Similarly, they’re used to modern amenities – air-conditioning, in particular, is the number one question NSU Residence Life is asked by potential students. 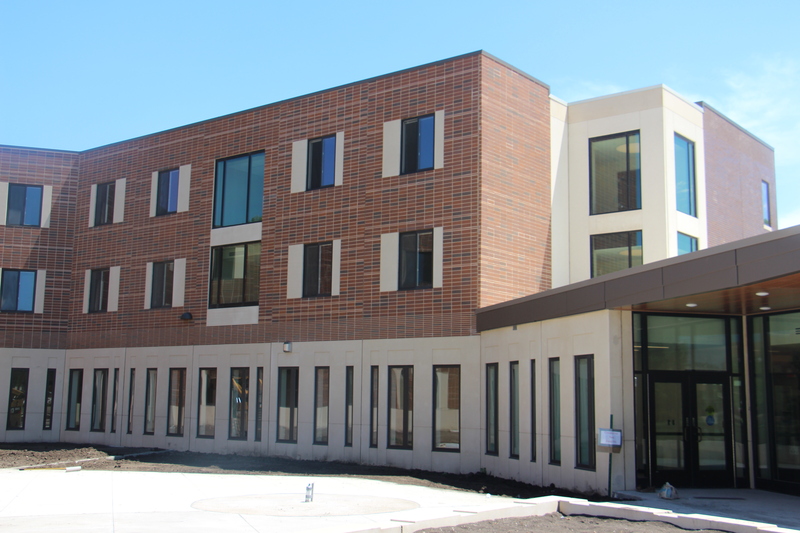 That sort of feature, along with conference rooms and study rooms offered in the new halls, has essentially caught Northern up with trends shaping student housing, said Sabolo. But NSU is also including more unique offerings in Great Plains East and West – including a Papa John’s Pizza, convenience store and game-cleaning room – which set the university apart. “I really believe that regionally, Northern is going to be the one that people are keeping up with,” Sabolo said. The combination of exposed precast concrete in an acid-etched and sandblasted textures and thin bricks replicates the look of stone-and-brick for Great Plains West and Great Plains East. 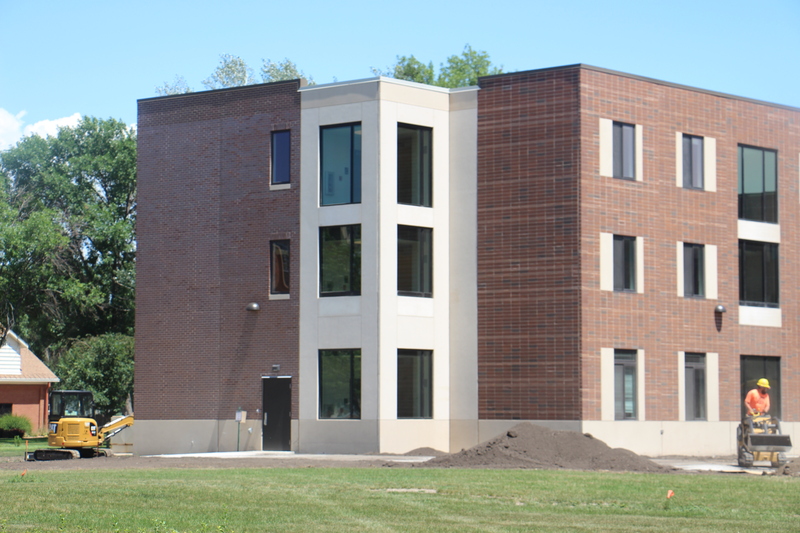 Five colors of brick in three different sizing were used for the twin residence halls. Two main field colors consisted of medium iron spot red modular size brick for the majority portion of building and autumn sands utility size brick with a brownish hue for courtyard portion of the buildings. A Desert Iron Spot Dark and Bordeaux Blend velour were used for banding to add horizontal lines and to create the top coursings of the modular brick, while roman size autumn sands brick with a velour texture provides accents to the utility brick panels in the courtyard. Standard brick sizes were used to emulate conventionally laid brick, with L-shaped bricks at corners and windows openings. The CarbonCast wall panels significantly reduced enclosure time compared to conventionally laid brick. “The use of thin brick as a precast veneer allows the design team limitless options, from color and texture, to sizes and locations, to achieve the correct design aesthetic for each individual project,” said Steve Miller, project manager with CO-OP Architecture. Northern’s campus has even more growth planned, and Sabolo said the new residence halls have led the way. Now that it has, he said, it’s increased anticipation of NSU’s other upcoming projects, including the Regional Science Education Center, regional sports complex, and athletic and recreation fields. “I think students are more excited about coming to Northern,” Sabolo said.